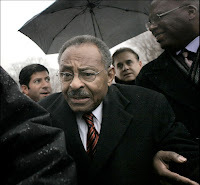 What is up with Roland Burris? My new senator seems to be having a problem. The biggest problem is that his story keeps changing. It seems like just yesterday he was standing in the rain outside of the U.S. Capitol, surrounded by a horde of media as he fought to be seated in the United States Senate. Now I see pictures of him running from reporters. The problem is that Burris was appointed by our now former and infamous governor, Rod Blagojevich. Although Blagojevich was under a cloud of suspicion for allegedly trying to sell the Senate seat of President Barack Obama, Roland Burris’ reputation was that of a man of political integrity. As a condition of securing that seat, Burris had to appear before the Illinois House impeachment panel and testify about the circumstances surrounding his appointment. During that hearing, Burris told the committee he had no contact with anyone in the governor’s office before the governor appointed him in late December to replace President Obama in the U.S. Senate. Then his story changed. He later told the committee that he had been contacted by a friend of the governor. Then his story changed again. He now says that he actually had contact with five people in Blagojevich’s camp, including the governor’s brother who asked Burris to raise money for the ex-governor. Now Burris’s reputation is under fire. And a chorus of colleagues, columnists and newspapers is calling for his resignation. I don’t know how all of this will turn out, but I do know that if Burris had told the truth, the whole truth and nothing but the truth, from the beginning, he wouldn’t be hearing calls for his resignation right now. Some might argue that if he had told the whole truth, he might not have the Senate seat right now. Except, he won’t have it anyway, if it comes out that he lied or if the FBI has tapes of him talking with the governor’s brother about fundraising. For now, it just makes it appear that Burris was willing to do anything to become a senator, at least to withhold the truth. He says he has nothing to hide, but it sure looks like he does. I am reminded of a scripture that urges us to flee even the appearance of evil. And also another that says your good name and reputation are more valuable than gold. And I might add, in this case, even more valuable than a Senate seat.